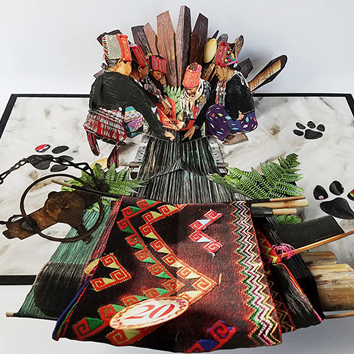 The centerpiece of We Are Tiger Dragon People is the world’s largest pop-up book titled Tao Hua Yuan Ji, which measures roughly 14 x 21 feet when open. 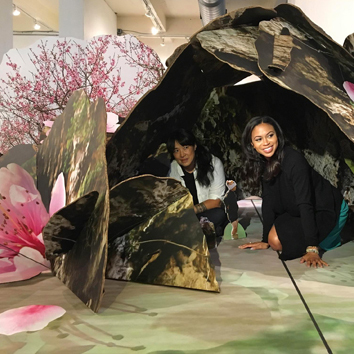 This massive paper structure, inspired by a Jin Dynasty poem about a secret utopian valley, depicts a cave ensconced in giant peach blossoms that Fu visited in 2008. Standing nearly 5-feet tall at its apex, the paper cave is large enough to crawl inside. 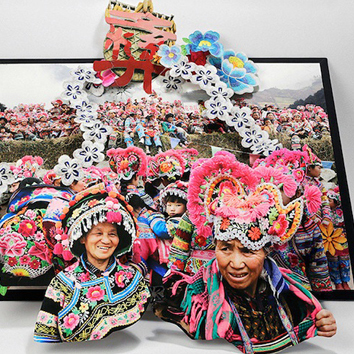 This exhibition not only follows Fu’s work in China, but also showcases earlier artworks inspired by unique destinations around the United Sates, demonstrating Fu’s process from photography to meticulously composed collages brought to life through lightboxes. The lightbox series Photo Binge was the artist’s MFA photography thesis at the Rochester Institute of Technology. 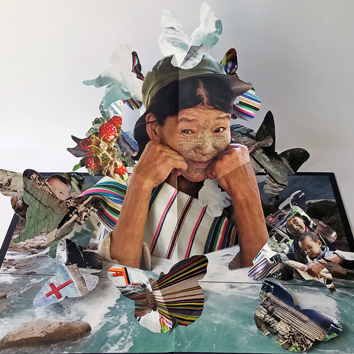 A precursor to her pop-ups, Fu’s digitally collaged images are constructed from her “quickly captured subconscious moments” into a boisterous conglomeration of hopes, fears, and desires. 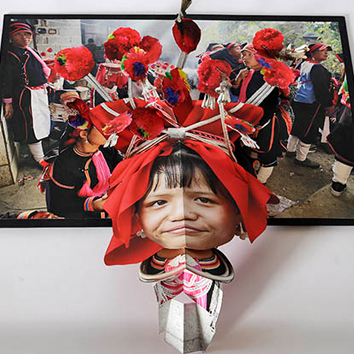 Colette Fu earned her MFA in Fine Art Photography from the Rochester Institute of Technology in 2003 and soon after began devising complex compositions that incorporate photography with pop-up paper engineering. She has designed for award-winning stop-motion animation commercials and freelanced for clients including Vogue China, Canon Asia, Moët Hennessy, and Louis Vuitton. 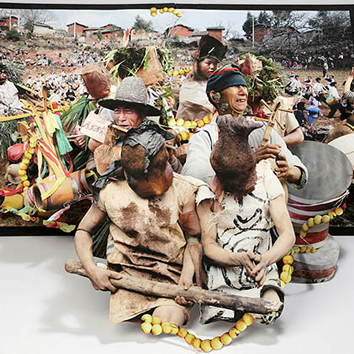 Fu's numerous awards include a Fulbright Research Fellowship to China and grants from the Independence Foundation, En Foco, the Virginia Museum of Fine Arts, and several other institutions. 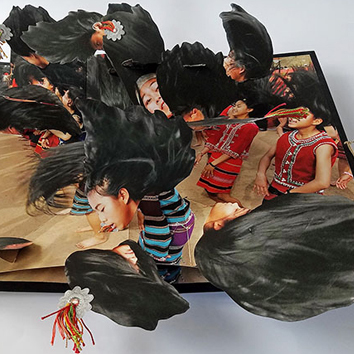 A passionate educator, Fu also teaches art-making as a way to give voice to communities through pop-up paper engineered projects. She teaches pop-up courses and community workshops to art centers, universities, and institutions internationally. 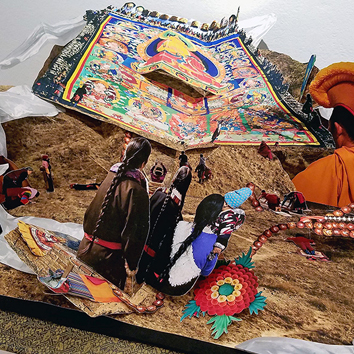 Colette Fu: We Are Tiger Dragon People is curated by Eva Thornton, Assistant Curator of the Taubman Museum of Art and will be on view February 2 – September 8, 2019, in the Medical Facilities of America Gallery and Temporary Exhibition Gallery. This exhibition is generously supported by the City of Roanoke through its Art Commission and the E. Rhodes and Leona B. Carpenter Foundation.